The result of 30 years of security industry experience and sector expertise, Synergy 3 provides the foundation for the turnkey solutions we deliver. Reliable, proven under the most extreme conditions, but highly flexible and user-friendly, our command and control platform helps ensure customers can always access the information that counts. Mission-critical data is made manageable, meaningful, and actionable. Synergy 3 achieves this by seamlessly integrating any number of independent third-party products and systems - from one or multiple sites - enabling them to be to be monitored, managed, and recorded from a single unified interface. Users receive a 360-degree view of security and surveillance that mitigates risk, improves operational efficiency, and supports rapid, informed incident response. Supported by our Synergy-ready range of servers, storage, display solutions, and control accessories, and maximized by powerful and intuitive software features including Dataveillance and dynamic Workflow generation, the end-to-end solutions we provide help customers quickly and easily interrogate the wealth of data at their fingertips, identify what matters, and take action. Tailored software tiers ensure that customers of any size can cost-effectively benefit from Synergy 3’s feature base, without having to worry about accommodating future growth. 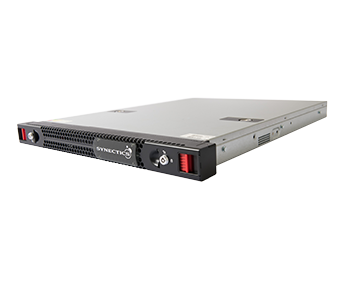 Synergy 3’s uncapped scalability allows for solution capabilities to be easily flexed and/or expanded as business and security needs change. Additionally, our open architecture software enables customers to leverage both existing devices and new technology, to create a truly tailored solution that maximizes investment and supports progress. We’ve also made sure to extend choice in how operators use our solutions. Customization runs throughout Synergy 3, from its user-friendly GUI and user-defined access rights, to highly tailorable reports and incident response automation. Even our latest tablet-based EX300 Control Suite has been engineered to maximize user choice and provide a more personalized and streamlined experience. Our development priorities also focus on ensuring system reliability and eliminating downtime. Intelligent hardware, software and database failover, backfilling video data from edge-based devices, and virtualized server resiliency make Synergy 3 the ultra-reliable system of choice for critical security, process control, and Alarm Receiving Center environments. Need to safeguard valuable video assets? If a network goes down, Backfilling enables seamless footage retrieval and restoration as if nothing happened.